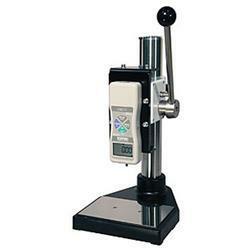 Model SVL-220S vertical manual lever test stands provide quick, consistent testing. Both compression and tension tests can be performed with a simple downward stroke of the lever. The test stand is designed to provide a simple move to change from compression to tension mode. Return springs reset the lever in compression mode and gravity does the work in tension mode. The stroke can be adjusted with a mechanical limit. 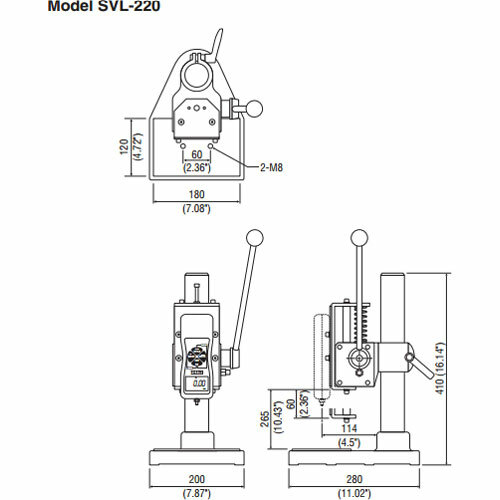 Model SVL-220 vertical manual lever test stands provide quick, consistent testing. Both compression and tension tests can be performed with a simple downward stroke of the lever. The test stand is designed to provide a simple move to change from compression to tension mode. Return springs reset the lever in compression mode and gravity does the work in tension mode. The stroke can be adjusted with a mechanical limit. The stands accommodate any of the standard range Imada mechanical or digital force gauges and can be equipped with a precision digital distance meter. SVL-220 is perfect for compression and tension applications where rapid action is desired.